Arteslonga, French Interior Decoration and Lifestyle Brand.
" Our dearest wish is to bring Beauty and Harmony into your interior, a perpetual and benevolent inner harmony so that you can achieve well-being in your place of life or work. Only true understanding, the deep vision of things, the right view, and the diligence in creation and execution allow the attainment of this invaluable quest: joy and well-being. " Arteslonga, French Home Decoration and Lifestyle House, offers a selection of unique art objects, antique, vintage and retro furniture chosen for their beauty, their elegance, their originality and simplicity. Arteslonga is a spirit, a French way of life, born of a desire of aesthetic and link to the evocative sensory-related memory of an object or intimate place. All vintage furniture and art objects selected by Arteslonga are on unique selling and are the testimony of the skills of artists and craftsmen. They contain the memory of time and gesture. Arteslonga share with you the love of the profession and passion conveyed by these craftsmen and artists. The richness and variety of vintage items and art objects are staged in multiple worlds and atmospheres fully created by Arteslonga. You are going to discover several vintage home decor with a romantic and glamorous French knowledge, always at the forefront of the trend. Arteslonga brings to the daily life difference, uniqueness and inspiring moments. Listed as single objects as in a gallery of art, you can purchase with a click original, refined and elegant vintage furnishings and authentic objects. Antiques, vintage furniture, art objects, contemporary Arts are harmoniously matched mixing unique home decoration styles, eras, and vintage decor. Arteslonga for an international clientele that loves creativity, simple, unique and different interior design, authentic and refined decorative items, always looking for better living, better memory and better transmission. Arteslonga, a gallery and mixtures of moods. "To exist is a fact, Living is an Art." Arteslonga, French Home Decoration and Lifestyle House. The chest ottoman velvet powder pink Litchi with its charming burgundy red fringes. Nice Ottoman with its beautiful fringes for a charming salon in the Napoleon III style revisited. A beautiful set of three clams (Tridacna shell) made of resin. An artisanal Italian hand painted, gold finish inside. Beautiful decorative objects with warm and shimmering colors.Remarkable pieces of elegance and delicacy made entirely by hand. Wonderful objects! Romantic porcelain cup on base and ornamentation of two beautiful parrots. A craftsmanship made of porcelain and bronze. A beautiful decorative object with soft colors, fresh and spring. A remarkable piece of elegance and delicacy made entirely by hand and hand painted. A beauty ! The first ships that crossed the Atlantic were the inspiration behind Chest Sofa, a furniture piece that will bring the feeling of adventure and discovery to your living room set. Upholstered in cotton velvet, this fabric sofa features a unique and memorable design. Nice oval swivel mirror in polished brass. To put in a bathroom or a room. A beautiful Venetian violin mirror made in the old fashioned way. The mirror is slightly quilted for a desired old effect. A beautiful size 138cm by 86cm wide. A beautiful decoration mirror unique in its kind. Delivery by carrier. The greatest care is taken to its packaging and protection for your delivery. Beautiful Shadow vase in purple frosted glass and metal base satin gold finish. A beautiful Italian craft. A limited edition. Height of the vase: 24 cm. Contemporary suspension in the style of the 70s.It remains very light in spite of its volume, with its very airy structure in aged gold metal and its round pieces of glasses. Aerial, it can be placed in different styles of decoration. Wonderful jewelry box made of lacquered wood and adorned with stone on the lid. A beautiful craft piece of Italian creation. Elegant Egyptian Cat statue, made of ceramic and hand painted. Very beautiful unusual decorative object, unique in its kind. Delicate black bookshelves in black wood with turquoises. A craftsmanship of all beauty. White coral on display. A white coral on its display stand is a decorative element that attracts attention in a room. Each piece is completely unique because of its creation from a natural coral in pretty white tones.The organic and textured coral creates a stunning contrast with the elegant black wood stand and brass support rod. Box hand painted ceramic, the lid is decorated with a butterfly made of gold metal and natural selenite base.Selenite is a mineral, which can be considered as a variety of gypsum if one follows the Anglo-Saxon habits or a synonym if one follows the French usage. Large black and white ceramic vase 62 cm high and 22 cm in diameter.Entirely painted by hand.Italian hand-made.A limited edition. Swallow Blue Velvet Round Stool and stainless steel shiny golden finish.Composition of velvet: 100% Polyester.A very comfortable seat for this ottoman whose seat diameter is 40cm.This round stool in velvet color Blue Swallow is also on sale on our site in other colors. Swivel table mirror made of brass.A simple and elegant mirror.Possibility of positioning it everywhere at home.Beautiful and practical. Beautiful bistro chair made of black birch wood.Beyond its singular beauty, this bistro chair is very comfortable, lightweight and very resistant.The Germaine Bistro chair will beautify your kitchen, your living room, your terrace, your veranda or your restaurant.Ideal with a raw wood dining table. Incredible object of decoration.A beautiful pearly cup made with natural Kabibi shell perched on the back of a silver-plated pink flamingo.The large silver flamingo is standing on its legs on a base made of crackled black shell.A remarkable and unique craft piece. Peacock square mirror consisting of a mosaic of round mirrors. The structure is in metal finish old gold. A beautiful decoration mirror unique in its kind. Wall attachment system.Delivery by carrier. The greatest care is taken to its packaging and protection for your delivery. Very beautiful Chinese buffet aged 80 years, weathered with time with poetry, floral patterns somewhat past, but still soft and fresh shades. A beautiful swallow blue color aged by time for this ancient buffet from the Gansu region of China. the lacquer is beautifully cracked. Beautiful old paintings and drawings. Incredible object of decoration. A box made of Ostrich egg shells (certified natural ostrich egg shells) perched on the back of a silver-plated flamingo. The large silver flamingo is standing on its legs on a base made of crackled mother-of-pearl. A remarkable and unique craft piece. The Loulou armchair in high version, in raspberry velvet color, offers a delicate touch and a remarkable seat. This 70's inspired design chair with curved backrest and extended armrests features a tulip-shaped swivel metal base. The Loulou armchair is a unique piece of furniture and a must for a chic and casual atmosphere. The large Manhattan mirror in Art Deco style from 1900-1920. A mirror of beautiful size measuring 122cm high by 76cm wide. A splendid decoration mirror unique in its kind. Delivery by carrier. The greatest care is taken to its packaging and protection for your delivery. Beautiful square vases 34 cl-m high and 14 cm wide painted in Malachite motifs. Entirely hand painted. Italian hand-made. A limited edition. Height of the vase: 34 cm. The Loulou armchair in velvet, raspberry color, offers a delicate touch and a remarkable seat. This 70's inspired design chair with curved backrest and extended armrests features a tulip-shaped swivel metal base. The Loulou armchair is a unique piece of furniture and a must for a chic and casual atmosphere. Beautiful resin vase with tortoise shell motifs in relief. Entirely handmade. Italian hand-made. A limited edition. Height of the vase: 26 cm. Large ottoman made with vintage leather patches brown color and patinated with colorless and matte wax. Brown color. A very comfortable seat of 30kg / m3 designed with pieces of foam for this leather ottoman. Diameter of the seat of 71cm. Table lamp made in brass with its pretty fringes in retro style. A modern and retro mix that we love. This table lamp is made of brass and the fringes made of polyester fabric yarn (The polyester fabric is made from a synthetic fiber). Superb black ceramic floral white vase.Entirely hand made.Italian hand-made.A limited edition. Superb ceramic floral white vase.Entirely hand made.Italian hand-made.A limited edition. The Kobe hanging lamp. An air Japonisant for this contemporary hanging lamp made of black iron and lampshade frosted white glass black metal strapping. White frosted glass globe. This luminaire of contemporary realization will fill pleasantly your home decoration creating a very beautiful bright atmosphere. Beautiful bistro chair made of honey-colored birch wood.Beyond its singular beauty, this bistro chair is very comfortable, lightweight and very resistant.The Germaine Bistro chair will beautify your kitchen, your living room, your terrace, your veranda or your restaurant.Ideal with a raw wood dining table. Romantic bowl hand made in natural horn and metal base. A craftsmanship of all beauty. A beautiful decorative object with soft and shimmering colors. A remarkable piece of elegance and delicacy made entirely by hand. A beauty ! Elegance and sobriety modernism for the Oval Side Table Gigi made in tinted glass and golden brass.With its chic and minimalist look, the Oval Side Table Gigi and its brass color, more authentic and refined than the walleye, eliminates any risk of lack of taste. The Kobe table lamp. An air Japonisant for this contemporary table lamp made of black metal and lampshade frosted white glass black metal strapping. White frosted glass globe. This luminaire of contemporary realization will fill pleasantly your home decoration creating a very beautiful bright atmosphere. Black metal structure. Heron sculpture made of porcelain with its brass paste. All details are hand painted. Very beautiful unusual decorative craft object, entirely handcrafted made in Italy. Table lamp with square base presented with a fossilized Ammonite. The ammonite is sawn in 2 to be able to admire its interior chambers completely crystallized. Rod and square base made of polished brass. Magnificent. Sold without the lampshade. Nice bench Mistinguette made of woven rattan, accompanied by a seat cushion in gray fabric. Its rounded structure can accommodate two people and has a sufficiently high backrest and an armrest to settle comfortably.His little cushion brings him a certain elegance. It will integrate perfectly with your interior. A Beautiful Mess.The Arteslonga Style in a beautiful book of decorative photographs: "A Beautiful Mess"New work published by teNeuesAbsolutely splendid and so inspiring. How to resist the charm of the Mistinguette screen? This beautiful screen has a curved rattan structure, with hand-woven fabric to slightly obscure the desired space. His eclectic style will make him a place apart, which will bring charm and natural inspiration to your home. A pair of porcelain candlesticks with a height of 36.5cm. Splendid blue and pink parrots resting on a branch of trees. A very nice presence for this pair of baroque candlesticks, romantic and naturalist. Brass candle holder worked and carved. Beautiful flamboyant colors. The Coffee Table Bonbon features a magnificent customized round marble top of 150cm diameter, which makes it gorgeous. Blue velvet upholstered body creates a rich contrast with the polish brass base and the marble top, enhancing the juxtaposition of 3 vibrant materials. Materials : Top: Marble, Body: velvet, base: polished brass. Elegance and sobriety modernism for the Gigi Console made in tinted glass and golden brass.With its chic and minimalist look, the Gigi Console and its brass color, more authentic and refined than the walleye, eliminates any risk of lack of taste. The Gigi armchair is covered with a printed fabric of stylized plumage, blue color. This Scandinavian-style armchair with its large backrest and wide, bouncy armrests has stainless steel legs. The Gigi armchair is a warm piece of furniture for a fresh and natural decoration. Cassis Rufa Seashell on black base One of a kind ! A unique piece equally cultural and natural. The mix between the brass structure and the walnut creates a sophisticated approach to this everyday center table. Inside you can display books or magazines that can be seen through the smoked glass. Its artisan quality and crafted work provides a striking centerpiece for your living room. Dog statue, Great Dane race, made of ceramic and hand painted. A reproduction of animal statues that were made in the 50s. Very beautiful unusual decorative object. Romantic porcelain cup and ornamentation of two beautiful hummingbirds. A craftsmanship made of porcelain and bronze. A beautiful decorative object with soft colors, fresh and spring. A remarkable piece of elegance and delicacy made entirely by hand and hand painted. A beauty ! The Sea Begonia Tree is a striking piece of decor which will draw attention in a room. Every tree is completely unique due to being created from natural coral in beautiful pink tones. The organic, textural coral creates a gorgeous contrast against the sleek black wooden stand. This one-of-a-kind decoration will indeed bring elegance to any interior. Group of purple shells (balrnacles) on brass stand. These sea shells from the Philippines are in fact the home of a filter feeder: Megabalanus tintinnabulum. Catching plancton with their tree-like arms wide open in the sea. A large bistro mirror consisting of a mosaic of small mirrors in the vintage style of the years 1900-1920. A beautiful size 127cm by 103.5 cm. A beautiful decorative mirror to recreate a cabinet spirit of curiosities. Delivery by carrier. The greatest care is taken to its packaging and protection for your delivery. Lovely chinese sideboard 80 years old, weathered by time with poetry, with floral motifs somewhat past but to always soft and fresh colors. A magnificent piece, unique and authentic. Beautiful oval white coffee table with its white marble top. This oval white coffee table in the design of the 70s is made of fiberglass for its central poor and white marble for its tray. A design in the spirit of the 60s-70s that we love. Lilac velvet chair in the high-end vintage style of the 50s, a beautiful rare elegance, the armchair Greta embellish your interior. An ample and beautiful chair. Table lamp with steel foot and white glass shade.A modern and Art Deco mix that we love.A magnificent presence. Side Table Enersto made in brass all in elegance, finesse and lightness.Brass finish and black Granite top. Superb large Chinese blue porcelain jar with dragon motifs. Entirely hand painted. Hand-made from China. Height of this jar: 102 cm! The Silvana Coffee Table carries an uncompromised retro style and strong presence. It boasts a verde guatemala marble top, supported by a stainless steel structure in a brass finish with a low shelf for storage. This marble and brass coffee table is fully inspired by the mid-century modern decor. Superb Ondine sofa in Velvet Blue Night in the purest style 70s measuring 363 cm long and 150 cm deep. It is designed from 4 sections of the Ondine chair. Each Ondine armchair, available for purchase individually, measures: 109cm wide x 95cm Depth by 83,5cm Height. Nice paper press in the shape of a bee.Sculpture made of aged brass with its drop of water in glass.A craftsmanship of all beauty.A very original decorative object. Superb decorative panel or paper wall covering in the Zuber style, evocative of the Garden of Eden. This vegetal wallpaper combines delicacy and refinement, a real decorative panel. Decorative panel with a height of 232 cm and 146 cm wide and 50 cm wide. Book ends Delicacy.Brass sculptures right hand and left hand on base.A craftsmanship of pure beauty. Superb jar with fauna and flora motifs in relief.Entirely hand painted.Italian hand-made.A limited edition.Height of this jar: 34 cm. Ceramic sculpture of flamingo with its black lampshade made in italy. Material: Ceramic Dimensions: H133 x D40 cm Very beautiful shape a magnificence and original presence ! Sold with its lampshade. Greyhound heads bookends made of metal colored bronze. Black lacquered and patinated porcelain pedestals. Original decorative object and fun. Lilac Velvet Round Stool and stainless steel shiny golden finish base.Velvet composition: 95% polyester and 5% cotton.A very comfortable seat for this ottoman of 30kg / m3. Diameter of the seat of 40cm.This Round Cherry Velvet Round Stool is also available on our website in Green Laurel, Rose Marshmallow, Raspberry and Ash Gray. Large Palmyre lamp made of brass with a height of 77 cm with green pleated velvet lampshade.A beautiful craftsmanship, a remarkable presence for this lighting.A beautiful lamp in the style of the 20-30 palm-shaped, with a square base, its trunk and foliage made of brass vintage finish. The design, shape and the velvet that covers the Glove armchair brings all its intense presence to this armchair. Exquisite armchair in velvet fabric. The base is made in polished brass. A majestic armchair of exquisite refinement which revisits the design of the 70s. Very beautiful figurine candle holders representing an Indian woman and man. These candle holders are made of ceramic and bronze. A remarkable craft work of exquisite refinement. At a height of 36cm this pair of candle holders are simply beautiful. Giant Round Mirror of 150cm diameter of great elegance. This round mirror with a circumference of 150cm will dress with grandeur and pomp your walls and interior. This great round mirror will become a major decorative accessory for your walls and give an amazing and luxurious style to your home, but in addition to this, a sensation of space to your room. Large Table Lamp Black Pearls 62 cm high made of brass. A beautiful craftsmanship, a remarkable presence for this lighting. Sold without lampshade. Superb Bruna black velvet banquette in the vintage 50's style. With an elegant elegance, the Bruna velvet bench excels in the art of displaying a luxurious line. Sublime and graceful bench in cotton velvet with its compass feet in polished brass. Stool in green sauge velvet and stainless steel. This stool is also available on our website in Pink, Green, Grey and Raspberry. Ottoman Magdalena in black velvet. Superb ottoman with its beautiful fringes for a charming salon in the style Napoleon III revisited. A remarkable piece made by hand with its comfortable square seat. Table lamp with its large blue porcelain parrot on a brass branch.Magnificent.Sold without the lampshade. Rosamund velvet armless living room chair, black color. A superb armless for a warm and charming living room in the style Napoleon III style. A remarkable piece made by craftsmen. Unique vintage sideboard made in poplar from China. Romantic painting handmade on the doors of this buffet of great originality with its bewitching charm. Beautiful painting painted on the structure. A unique ancient buffet of remarkable beauty. Beautiful chair made of honey-colored cane rattan.This rattan chair is designed for indoor use.Beyond its singular beauty, this rattan chair is very comfortable, lightweight and very resistant. Beautiful Movie Star wall light (right) with its round white glass and black & gold finish iron structure. Beautiful stylized Wall lamp made in iron and glass. A beautiful vintage carpet from Anatolia. A unique hand-woven hand-knotted piece of beautiful deep blue color. This beautiful monochrome handmade rug, entirely woven and hand-knotted, will contribute to the beautification of your place of life. The Floor Lamp Palm Movie Star. A large floor lamp of 147cm tall in the style of the 20-30s in the shape of a palm tree, with a black square base and its trunk (ø31cm) and leaves made of brass with a vintage finish (ø62cm). Its design makes this light a masterpiece and perfect for an exotic or modern environment. Large kilim rug with Roses from Moldova. Fully hand-woven. Beautiful vintage Moldovian rug. A beautiful floral pattern. Beautiful naturalistic globe containing different varieties of butterflies on branch with moss and lichen. Magdalena velvet armless living room chair, green color. A superb armless for a warm and charming living room in the style Napoleon III style. A remarkable piece made by craftsmen. Reissue of a witch mirror, with black and gold turned wood frame with a diameter of 75 cm.These convex mirrors were called "mirrors of witches" because magical powers were attributed to them. Beautiful farmhouse table Elegant and friendly monastery in massive raw wood made by hand. A dining table with large dimensions for this farmhouse table with superb Monastery type column legs: length of the tray: 330 cm by 110cm width. This farmhouse table Monastery is a dining table of great elegance whose charm of drawing does not leave indifferent. Farmhouse table called Monastery table in old pine wood. Completely renovated and stripped pine wood. Superb Monastery table with its huge tray 180cm long and 90cm wide, up to 8 guests. Large farmhouse table called Monastery table in old pine wood. Completely renovated and stripped pine wood. Superb Monastery table with its huge tray 220cm long and 105cm wide, up to 12 guests. Farmhouse Table "Aix-en-Provence" Farmhouse Table "Aix-en-Provence"
Square dining table in the industrial vintage style with legs "Eiffel Tower" made in plain black brushed metal and antique teak top (increased resistance to stains, easy to clean surface, outstanding durability and fade resistance). Shape and size of the tray: 70cm wide and 5cm thick. Square table with a 75cm height. "Aix-en-Provence" dining Table made ​​of natural wood. Contemporary farmhouse table, made ​​in ancient pine. A French manufacturing elegant and friendly. We chose this model because this model made entirely in wood combines contemporary style and authenticity. A unique piece of furniture, charm style. Rectangular wooden table evocative of modernist design and minimalist sculpture by Brancusi's work, and his workshop. Reclaimed pine wood, black patina finish. Very nice finish and patina handmade for this wooden table black color. Rectangular wooden table evocative modernist design of minimalist sculpture by Brancusi's work, and his workshop. Made of old pine wood, antique black finish. Rectangular wooden table evocative of modernist design and minimalist sculpture by Brancusi's work, and his workshop. Reclaimed pine wood, black antique patina finish. Top thickness 6 cm. The round table d'Este. A Shabby chic round table made of old pine wood. A beautiful round table top of 140cm, 5cm thick. Exquisite large raw wooden dining table. Timeless, friendly and generous wooden dining table. A beautiful raw wood dining table, an authentic piece made by hand entirely in of old wood, for inside or outside, very strong. Raw wooden Dining Table "Studiolo" Raw wooden Dining Table "Studiolo"
Beautiful old wooden table extremely durable. A craft room at the authentic look, for indoors and outdoors. The dining Table W is made of brushed metal for the structure and solid oak for the top. This dining table is also available in the following size: 200 and 250 cm by 90cm. This table can be made on request at the dimensions of your choice, please contact us. Beautiful contemporary dining table in the industrial vintage style with its legs "Eiffel Tower" made in brushed metal and antique teak table top (increased resistance to stains, easy to clean surface, outstanding durability and fade resistance). Beautiful teak top of 5cm thick. The wooden dining room table Gioia is made of solid oak. With a simple and pure beauty. Magnificent plateau of 160 cm long and 80cm wide. plate thickness: 2 cm. Craftsmanship of the highest quality. Between industrial inspiration and natural materials, rough, where the wood nodes are often put forward, this solid wood dining table is a perfect workmanship. Superb artist workshop dining table made in raw wood handcrafted in old pine. Magnificent table top with beautiful veining of the wood: 230 cm width by 140 cm. A very beautiful depth: 140 cm !! An aspect and a design that we love in a bohemian and country chic styles at the same time. The Brumby Wooden Farmhouse Dining table Large rectangular wooden dining table of 300cm long designed and made by craftsmen. Beautiful workmanship. Beautiful Dolmen Table made of Soar wood and black metal legs. A contemporary dining table, made ​​of massive Soar wood. A solid and unique design and manufacturing, a "monumental" achievement. Ravoux raw wood table with its 205 cm and 105 cm wide top.A dining table, friendly and generous made of teak.A beautiful raw wood dining table natural authentic piece of indoor or outdoor, very resistant. The 007 Dining Table. Stylish contemporary dining table in solid oak with brushed black metal pedestals. Very nice dining table with modern design, a unique production, a contemporary realization in solid oak. A unique dining table model whose current work of cabinetry combines contemporary spirit and quality. Stylish contemporary oval dining table made entirely in ironwood. Very nice oval dining table with modern design, a unique production, a contemporary realization in ironwood. Ironwood is a common name for a large number of woods that have a reputation for huge hardness. Dolmen dining table with square tray made of natural wood from Suar with its central base in brushed black metal. A beautiful table with modern design for a kitchen for example, a terrace, a dining area by a swimming pool. A relatively small but incredibly powerful dining table thanks to its thick wooden square tray of 7.5 cm forming waves. The beautiful dining room table Gioia is made of solid oak. With a simple and pure beauty. Magnificent tabletop of 250 cm long and 90cm wide. Table top thickness: 5 cm. Craftsmanship of the highest quality. Dolmen Table made of Soar wood. Contemporary dining table, made ​​of Soar wood A solid manufacturing and unique design, a "monumental" achievement. We chose this model because this current table woodwork combines contemporary style and authenticity. Great Renaissance Tuscany Table, Italy. 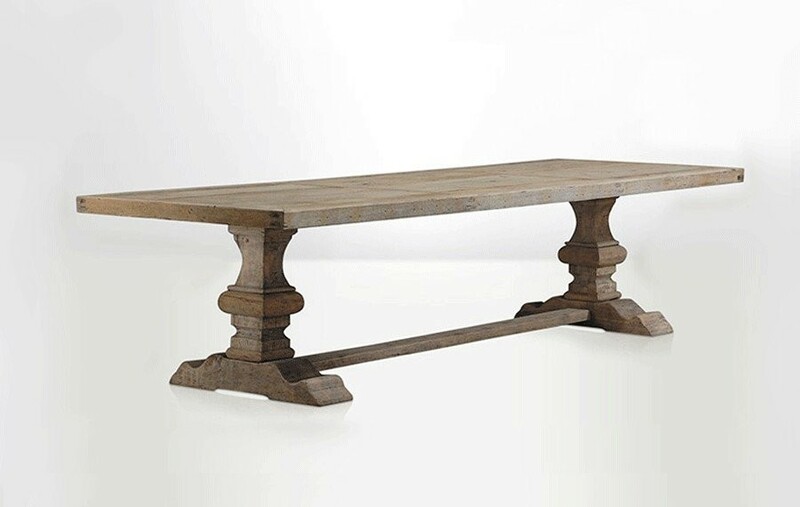 Re-edition of a Tuscan table from the early 18th century, featuring a wrought iron scroll, typical of the era in Italy.Material: pine woodPatina: wear, wood stung by worms. Dining Table Berlin made in solid teak. Tray with a length of 205cm and 100cm deep. This dining table is characterized by its beautiful 50s design, sobriety and natural elegance. This oval dining Table W is made of brushed metal for the structure and solid reclaimed charcoal black for the top. This oval dining table is also available in the following size: 240x130x76cm. This current work combines woodworking expertise, contemporary and authenticity . Everything about this beautiful dining table makes us squeal with delight. I It's rustic looking in salvaged bleache pine wood, chunky and will squeeze plenty of family and friends round it for any spontaneous Sunday lunch. No dining room would be complete without this stunner. Stunning double pedestal dining table made in old pine. A beautiful raw wood dining table that comfortably sits 6 but if you don't mind being cosy you could happily sit 8 (the more the merrier as far as we are concerned). A large wooden dining table to make memories around as it will become part of the family. Beautiful contemporary oval dining table with its 170cm long marble tray and 110cm deep. This oval table design 70s is made in faux-marble for the top and fiberglass for the round feet. A black faux-marble design spirit from the 60s-70s that we love. The beautiful dining room table Gioia is made of solid oak. With a simple and pure beauty. Magnificent tabletop of 250 cm long and 100cm wide. Table top thickness: 5 cm. Craftsmanship of the highest quality. The Olympe Wooden Dining table table. Large rectangular wooden dining table of 300cm long designed and made by craftsmen. Beautiful workmanship. Beautiful round design white faux marble table with its tray of 119.5cm in diameter and conical legs. This round table design 70s is made of MDF, resin and fiberglass. A design spirit of the 60s-70s that we love. The rectangular dining table Clay with rounded corners for softness is a contemporary achievement in a pure industrial style with its brushed metal compass legs and recycled teak top (increased resistance to stains, easy-to-clean surface, exceptional durability and resistance fading). The dining Table W is made of brushed metal for the structure and black solid oak for the top. This dining table is also available in the following size: 200 and 250cm by 90cm. The Ulysse Wooden Round Dining table. Very nice round dining table of Etruscan style. Base column made in carved old elm and its tray in old recycled pine. The round dining table Edgar made in oak with its superb inlaid tray 130cm in diameter and 7 cm thick. Chic country style round table made of aged oak. Stunning wooden column stand in Gustavian style. A beautiful round table top of 140cm, 5cm thick. Contemporary table inlaid oak veneer, chocolate finish. Black brushed metal base. Good proportion for this elegant contemporary table with its rectangular tray of 230cm long and 100cm deep. The Montesquieu dining table in solid wood with its elegant baluster legs.A rectangular dining table of 184 cm long that can go up to 240 cm in length thanks to its length of 56 cm.A very beautiful manufacture designed and made by hand. Beautiful contemporary oval dining table with its 170cm long tray and 110cm deep. This oval table design 70s is made of MDF, resin and fiberglass. A gray faux-marble design spirit from the 60s-70s that we love. Beautiful Oblong dining room table with its beautiful marble top and black brushed metal structure. With its oblong marble top, this marble dining table has a very contemporary design. It will come to beautify the living room or the kitchen of your house. The Table W is made of black brushed metal for the structure and its superb tray in solid oak stained in black. The W table can be elegantly used as a desk. Made-to-measure realization possible to the dimensions of your choice, contact us contact@arteslonga.com to receive a quote within 24 hours.